284 pages | 27 B/W Illus. As firms increasingly rely on knowledge as a key factor for innovation, the ability to innovate is increasingly perceived as a key asset for being competitive in international markets. 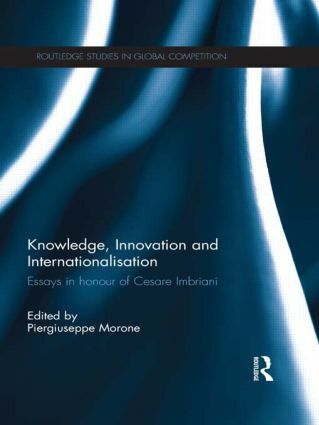 This new volume argues that innovation, knowledge and internationalisation should be viewed as tightly related concepts. It provides a stimulating and comprehensive framework for understanding key tendencies in modern economics, as well as an overview of the state of the art in the three fields covered. The first section explores in detail the relationship between knowledge and the innovative capability of firms, focussing on key topics such as social capital, intentional knowledge diffusion and unintentional knowledge spillovers. Section two examines the drivers and the impact of innovation strategies, assessing the role of technological advantage, networking and R & D investments in innovation, as well as the impact on innovation on the labour market. The third and final section examines the ongoing internationalisation process faced by ‘global’ economies. The topics explored in each section are tightly linked, ensuring that a strong thematic thread runs through the collection. Piergiuseppe Morone is associate professor at the University of Foggia, Italy.